Germany has conceded that Spanish produce is not responsible for a deadly E.coli outbreak that has claimed 16 lives in Europe – but the true source of the contamination remains unknown. Spanish cucumbers are not the source of the deadly E.coli outbreak, says Germany. 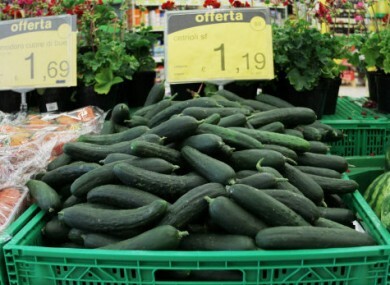 GERMANY HAS CONCEDED today that Spanish cucumbers are not the source of a deadly E.coli outbreak that has left 16 people dead and hundreds seriously ill.
Spain is furious at the suggestion that its produce was responsible for the fatal outbreak, the BBC reports. The country’s agriculture minister Rosa Aguilar said last night that “irreparable damage” had been done to Spain’s production sector, according to the Guardian. Spain is now losing €200 million a week over the scare, with Spanish farmers complaining that so many orders are being cancelled that they have no choice but to layoff workers. Germany, Denmark, the Czech Republic, Luxembourg, Hungary, Sweden, Belgium and Russia have all placed bans Spanish cucumbers. The scare has come at a particularly bad time for Spain, as the country is currently suffering the highest unemployment rate in the EU – which now stands at a huge 21.3 per cent. There have been 16 fatalities due to the outbreak, including 15 Germans and one Swede who had recently returned from a trip to Germany. More than 1,000 people are suffering from an E.coli infection and 373 have been classed currently seriously ill, having developed hemolytic uremic syndrome (HUS) – a rare complication that can arise from the infection. Cases of infection have been confirmed in Britain, Denmark, France, the Netherlands, Sweden and Switzerland, all involving people who had travelled to Germany. No cases have been reported in Ireland. Germany is still advising consumers to avoid eating raw tomatoes, lettuce and cucumbers, however the authorities are still no wiser as to the source of the outbreak. The Financial Times reports that an emergency meeting of national food safety experts took place in Brussels last night, after which spokesman for the EU agriculture commissioner said: “Our absolute first priority is to clarify the source of the outbreak because, if we can’t do that, we’re not going to win back consumer confidence”. Email “Spanish cucumbers not responsible for E.coli outbreak”. Feedback on “Spanish cucumbers not responsible for E.coli outbreak”.